When I started my Code Cop brand in 2009, I created some T-Shirts and even a button. Back then I was not running my own business and giving them away for marketing purposes did not make sense. So I used them as a sign of appreciation. 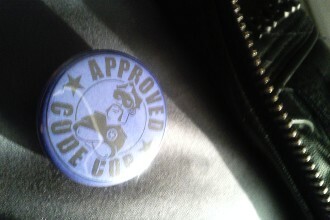 The button reads - or rather should read - Code Cop Approved because I have approved ;-). (Unfortunately I did not think about that when designing it, and some people understand it as Approved Code Cop, which is fine for me as well.) Because I am strict, I use them rarely. I am giving them away for various reasons - all very much appreciated. Here is the list of approved individuals. 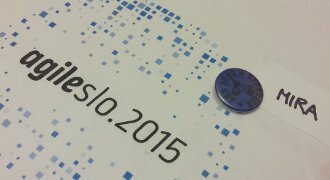 From 2011 to 2013 I organised Hackergarten in Vienna. When starting a community it is difficult to find contributors and hosts, let alone sponsors. Several local companies and open source committers supported us to get started with Open Source: Robert Handschmann, Claus Polanka, Siegfried Goeschl, Kilian Matt, Dmitry Jemerov, Rafael Cordones Marcos, Stefan Strobl, Andres Almiray, Dierk König. GeeCON is my favourite conference. I have been there many times. During one of my early visits, I got to know some of the organisers and we became friends. I really appreciate that conference and the work they put into it: Adam Dudczak, Adam Parchimowicz, Lukasz Stachowiak, Konrad Malawski, Adrian Nowak. During my Pair Programming Tour I paired with many developers. I learned something during each of these sessions, and every one of my pairing partners got approved. See the Journeyman Tour Index for more details. I would need to put more names into this list, e.g. Thomas or Adi, but they already own a button. Looks like I need to upgrade to a gold version of my button to approve repeated cases of awesomeness. Thank you all, very much appreciated.